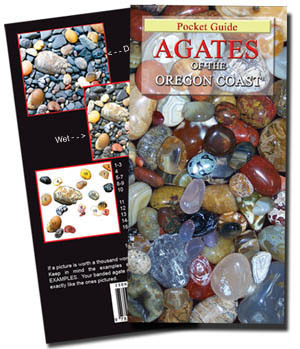 < - - This popular pocket guide Agates of the Oregon Coast is the NEW comprehensive, easy-to-use full color illustrated guide of the what, where, when and how of information on agate, jasper, fossils and petrified wood commonly found on the Oregon Coast. This guide shows the specimens in their rough natural state and the cover shows them in all of their polished glory. Amazingly accurate! Learn about the best known varieties of agate to zeolite, in all of their stunning colors and varieties of agate to be found. 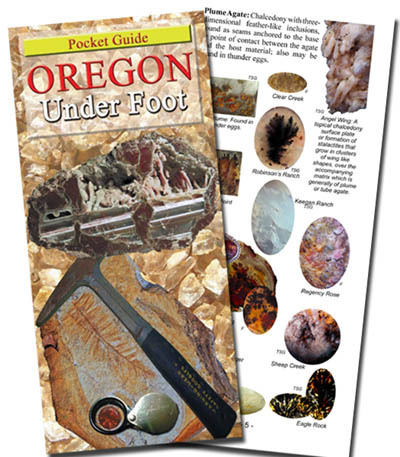 Included are the enhydro (water agates), fossil agates, petrified woods, and fossils that may be found among the cobbles along the Oregon Coastal beaches. While many specimens are readily available, the rare and higher-quality ones are highly sought after. Just take your dry stones and lay them over the photos to identify them. During the winter and early spring, you will want to re-visit the coast to search for agates. Oregon has great public beach access to welcome those who wish to indulge! There are excellent locations for watching the waves, whales, sunsets and storm watching, the coast is a treasure trove for collecting driftwood, agates, shells and floats. Bedrock exposed from the sea at low tide creates perfect pockets for tide pooling, and beach combing, just for challenging the adventure seekers. Status: They are In Stock and ship immediately, Get Yours NOW! Only $6.95. Plus Shipping. 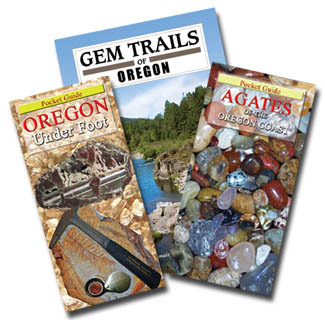 OREGON TRAVELER'S PACKAGE for Rockhounding Oregon - includes all three of the above Gem Trails of Oregon, which is a detailed handbook of maped locations, Oregon Under Foot, and Agates of the Oregon Coast < - - (Amazingly accurate, just take your dry stones and lay them over the photos to identify them) these companion guides with full color photos for identification of what you are likely to find all ships as one parcel. Save on shipping of this package, with - FREE Shipping to U.S. destinations by USPS media mail. In Stock and ships immediately, shipping weight 2 lbs. NEW List Price - $30.85. Buy it NOW and SAVE! Only $29.95. 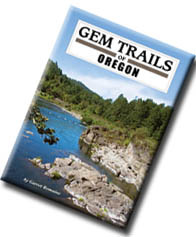 The Beachcombers Gem Scoop featured on the inside cover is available from Wesley's Trading Post, in Newport. ©2017 Agates Of The Oregon Coast.